382 Marlborough is located on the south side of Marlborough, between Hereford and Massachusetts Avenue, with 380 Marlborough to the east and 384 Marlborough to the west. 382 Marlborough was designed by Peabody and Stearns, architects, and built in 1881 by Woodbury & Leighton, masons, as the home of James Mascarene Hubbard and his wife, Sarah Hill (Tomlinson) Hubbard. He is shown as the owner on the original building permit application, dated June 1, 1881. Sarah Hubbard purchased the land for 382 Marlborough on March 19, 1881, from Benjamin Williams Crowninshield and Walter Channing Cabot. It was part of a parcel with a 498 foot frontage on Marlborough, extending west to Massachusetts Avenue, that they had acquired on January 20, 1880, from John Brooks Fenno and William Storer Eaton. J. Brooks Fenno and William Eaton had purchased the land that same day from Grenville T. W. Braman, Henry D. Hyde, and Henry M. Whitney, trustees of a real estate investment trust that had purchased several parcels of land on March 1, 1872, from the Boston Water Power Company. 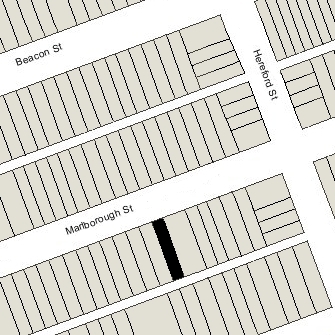 Click here for an index to the deeds for 382 Marlborough, and click here for further information on the land on the south side of Marlborough between Hereford and Massachusetts Avenue. Plans for house are included in the Peabody and Stearns Collection in the Boston Public Library’s Arts Department (reference PS/MA.081). 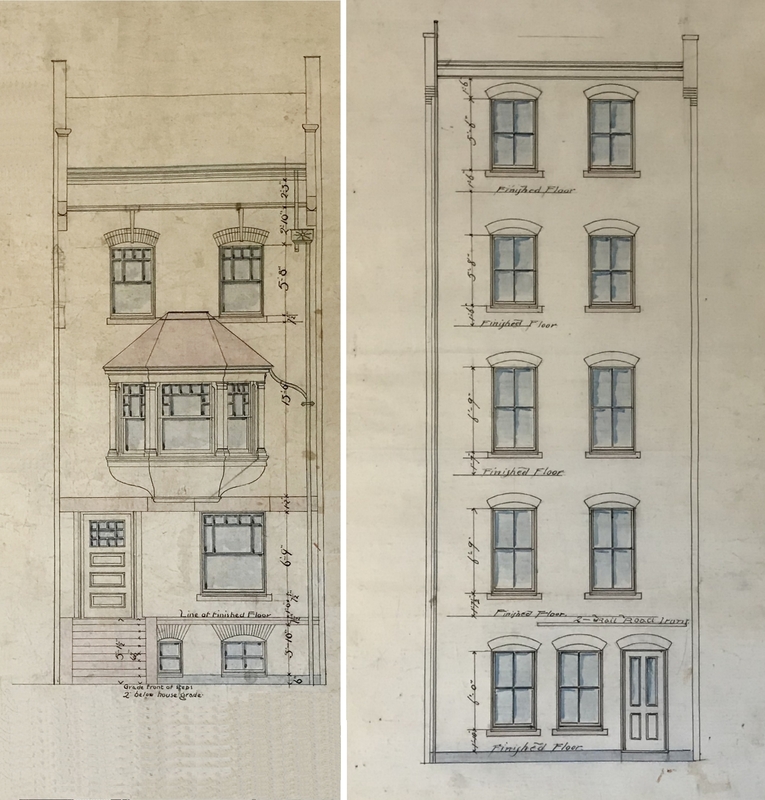 The plans include drawings of the front and rear elevations and floor plans, including three alternative designs, one with front and rear bays, a second without bays, and a third (which was built) with a substantial oriel window in the front on the second floor and no rear bay. The plans also include framing plans for each floor and a piling and foundation plan. The plans refer to a June 1, 1881, contract for construction of the house. Click here to view the original plans for 382 Marlborough. By the 1881-1882 winter season, James and Sarah Hubbard had made 382 Marlborough their home. They previously had lived in Grantville. James Hubbard’s brother, Charles Eustis Hubbard, lived at 386 Marlborough. James Hubbard was a former Congregational Minister and former assistant librarian of the Boston Public Library. He subsequently was editor of the Youth’s Companion magazine, book reviewer, and author. James and Sarah Hubbard’s son, Paul Mascarene Hubbard, a lawyer, lived with them. He married in December of 1905 to Martha Hartley Coit, after which they lived in Brookline. James and Sarah Hubbard continued to live at 382 Marlborough during the 1906-1907 winter season, but moved thereafter to The Austerfield at 502 Beacon. 382 Marlborough was not listed in the 1908 and 1909 Blue Books. On November 9, 1908, 382 Marlborough was purchased from Sarah Hubbard by Lucy Goodwin (Wadsworth) Sullivan, the wife of Thomas Russell Sullivan. They previously had lived at The Stratford at 31 Massachusetts Avenue. Thomas Sullivan was an author and playwright. His most noteworthy work was an adaptation of Stevenson’s Dr. Jekyll and Mr. Hyde for the stage, as a vehicle for the actor Richard Mansfield. Lucy Sullivan was president of the Ellis Memorial Settlement House for 25 years. Thomas Sullivan died in June of 1916. Lucy Sullivan continued to live at 382 Marlborough. She also maintained a home at Eastern Point in Gloucester. By 1915, Lucy Sullivan’s brother, Eliot Wadsworth, also lived at 382 Marlborough. He was associated with the engineering firm of Stone and Webster until 1916, when he resigned to become the executive head of the American Red Cross. From 1921, he served as Assistant Secretary of the US Treasury. He married in July of 1922 to Nancy Whitman. 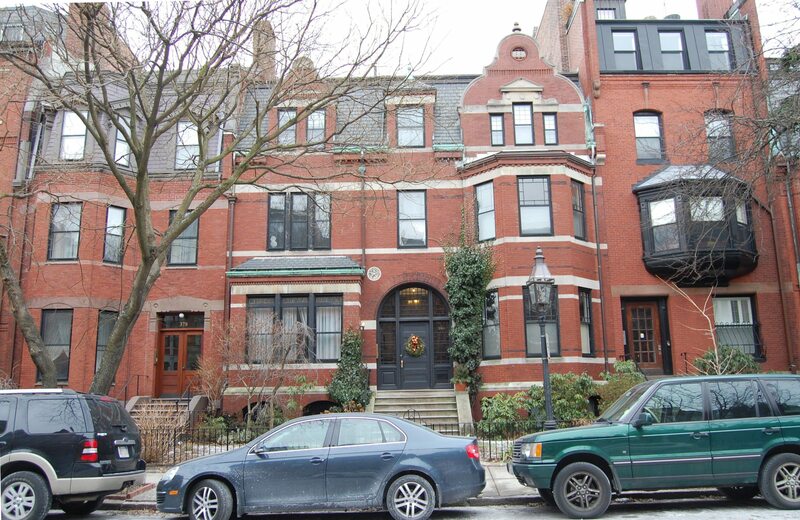 Although living in Washington DC, they continued to maintain 382 Marlborough as their Boston address until 1925, when he resigned from the Treasury and they returned to Boston. They subsequently purchased and moved to 180 Marlborough. During the 1933-1934 winter season, Lucy Sullivan was joined at 382 Marlborough by her brother, Oliver Fairfield Wadsworth, Jr., and his wife, Rose Evelyn (Miller) Wadsworth. He was a real estate investor and broker in Montana. Lucy Sullivan continued to live at 382 Marlborough until about 1943. On October 13, 1943, 382 Marlborough was purchased from Lucy Sullivan by H. Eleanor Blewett. She was an elevator operator and lived in Charlestown, and served as a real estate conveyancer. On December 30, 1943, she transferred the property to Georgiana (Perry) Ucello, the wife of John S. Ucello, and on January 14, 1944, it was acquired from her by real estate dealer Frederick E. Ordway. By 1944, 382 Marlborough was the home of Mrs. Natalie Eliza (Adams) Johnson, the former wife of Clarence E. Johnson. She previously had lived in Methuen and Shawsheen Village (Andover). Her widowed father, William E. Adams, her son-in-law and daughter, Robert Carl Vogt and Shirley Kathryn (Johnson) Vogt, and her unmarried daughter, Lois Lorraine Johnson, lived with her. By 1947, she also had begun accepting lodgers. Natalie Johnson and her family continued to live there until about 1948. On March 31, 1948, 382 Marlborough was acquired from Frederick Ordway by Rella Alice (Brown) Thompson, the wife of Henry Denman Thompson. They lived at 184 Marlborough. On the same day, the property was purchased from Rella Thompson by Eunice R. Jones. She previously had lived at 16 Exeter. where she had operated a lodging house. That same month, Eunice Jones applied for (and subsequently received) permission to convert 382 Marlborough from a single-family dwelling into a lodging house. Eunice Jones continued to live (and operate a lodging house) at 392 Marlborough in the early 1960s. On October 1, 1963, 382 Marlborough was purchased from Eunice Jones by Robert William McConnochie, Jr., and his wife, Alice Marie (Andersen) McConnochie. They lived in Needham. On March 6, 1964, 382 Marlborough was acquired from the McConnochies by Edward P. George, a real estate agent. He was unmarried and lived at 12 West Cedar. On August 20, 1965, 382 Marlborough was acquired from Edward George by Robert Joseph Driscoll and his wife, Geraldine Ann (Leahy) Driscoll. They lived in Winchester. 382 Marlborough remained a lodging house. On April 27, 1979, 382 Marlborough was purchased from the Driscolls by Joseph Griecci and John Stow, trustees of the 382 Marlborough Street Realty Trust. In May of 1979, they applied for (and subsequently received) permission to convert the property from a lodging house into four apartments. 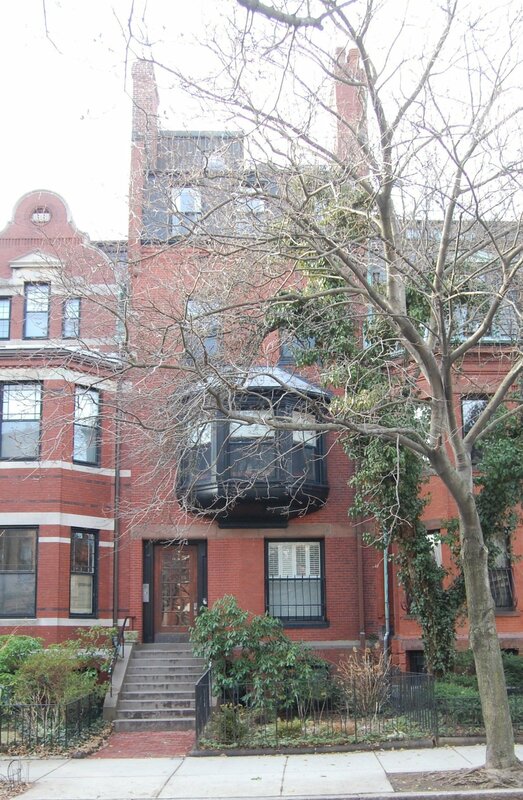 On April 14, 1980, they converted the property into four condominium units, the Back Bay Marlborough Condominium.